On my bookshelves, after my chronologically ordered issues of Overland, Meanjin, Going Down Swinging etc., after my poetry collections, alphabetised by poet’s surname, sit the anthologies in no particular order other than size. An anthology could easily get lost in the melee, unless it is read frequently. I can always put my hand on my copy of Penguin Modern Poets issue 5 featuring Gregory Corso, Lawrence Felinghetti and Allen Ginsberg. The Penguin Modern Poets series of books were published between 1962 and 1979 to introduce contemporary poetry to new readers. This was a first as, before Penguin, poetry was published in obscure chapbooks or expensive hardcovers. The Triptych Poets series, published by Blemish Books, returns to this tradition. An annual release started in 2010, issue 2 was released on 6 October 2011 and features the work of Stuart Cooke, Bronwen Manger and Ouyang Yu. From the Blemish Books website, ‘We’re hoping to highlight the contrasting and often complementary nature of contemporary poetry.’ This goal is certainly achieved in issue 2. Three very different poets that work well together; the anthology flows beautifully. Paying homage to Neruda and Chilean poetics, Cooke’s poems are steeped in surrealism but he also retains a grip on an Australian tone. These combine to create a unique voice. Cooke’s enjambment is jarring and breathless, the lines are roughly iambic, the standalone ‘f’ at the end of the second line doesn’t count as a foot but adds to the stammering, thirsty drawl of the poem. nothing is so plain to see. through the green leaves on the tree. in your eyes – love for which the wisest weep. Yu uses Chinese characters, which cannot be copied here, but are mentioned purely because they are interesting in that they don’t need translation; they offer a mystique to the poetry, a licence to interpret as you see fit. I wish I could go into more detail here – these three poets deserve reviews in their own rights as each section of this anthology is a worthy collection in itself. 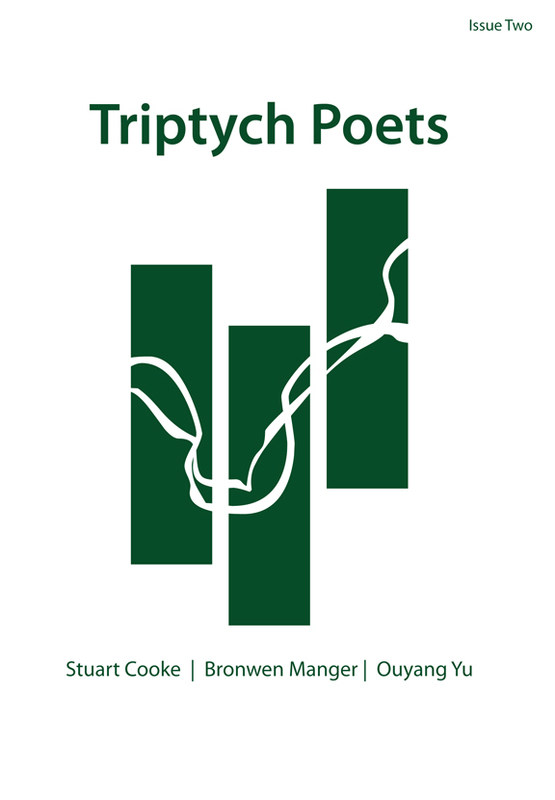 Suffice to say, the Triptych Poets Issue Two holds its own in the tradition of the Penguin Modern Poets series, allowing the reader to compare three very distinct voices that combine to flow in one wonderful collection.